Scientific Protocols is built on top of the GitHub platform. This allows the site to have advanced features. In order to use features of GitHub you need to have a free GitHub account. GitHub is a web-based hosting service for projects that use the Git revision control system. Learn more about GitHub. 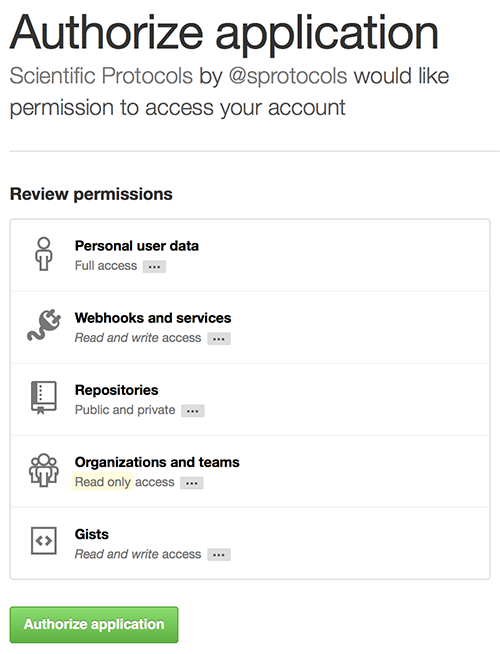 If you already have a GitHub account you simply need to authorize Scientific Protocols to have access to it. Authorization will occur when you click either sign in or sign up. If you do not have a GitHub account you can easily create one. Click sign in or sign up on the Scientific Protocols site. When presented with the GitHub login page click the sign up button. Complete the GitHub signup process. You will be redirected to the Scientific Protocols site upon completion. Now that you have successfully signed up you're ready to create a protocol.